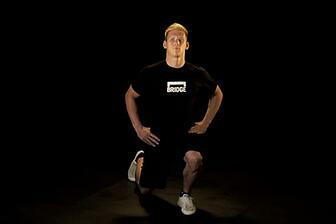 Today we will be introducing the BW Split Squat. Start in a lunge position, both feet facing forward. Work on maintaining balance as you lower your hips toward the ground. Aim to keep your front knee over the middle of your front foot. Avoid letting your front knee drift over your toes. Pause when your back knee is a couple inches off the ground and your front thigh is parallel to the ground. Return slowly to the start position. Repeat for prescribed reps on the same side. Switch legs and repeat on the other side.